Roller-skating makes family fitness easy. It’s great for burning calories, improving heart health, and improving muscle strength and flexibility. If you want to maintain a good fitness level, all you need to do is skate around the rink to your favorite top 40’s tunes. But if you’re ready to take your skate fitness to the next level, we have everything you need right here. Athletes are always in search of new cross-training exercises. Roller-skating may not be the first one to come to mind, but once you add it to your rotation, you’ll never go back. 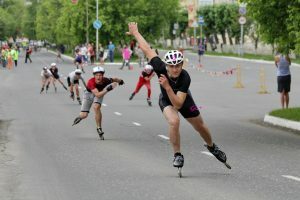 Skating builds muscle tone, flexibility, agility, and endurance. It’s easy to learn and fun to do. Best of all, it’s low-impact, so you can give your joints a rest before getting back in the game. Ready to roll? Here’s what you need to know. Speed skate. The faster you go, the better cardio. Warm up your hamstrings, thighs, and glutes with a few leisurely trips around the rink. Then it’s time to tackle speed work! Skate just under your top speed for 20 seconds. Reduce your speed for 40 seconds, then indulge your need for speed again. Repeat for 10 minutes. As you build muscle tone, you’ll also build endurance, allowing you to skate for longer periods of time. Get low. Are you engaging your glutes, hamstrings, and lower back? You will if you squat! To squat while you skate, lean forward and stick out your derriere, sinking down about 45 degrees. Alternate off skating straight and in the squatting position. You’ll tone those hamstrings in no time! Weave. Introduce a new move to your skating arsenal by weaving around the rink as if you’re weaving in and out of traffic cones. This move will develop the muscles in your outer thighs, hips, and obliques. Just watch out for other skaters! Whether you’re a semi-professional skater or you just want a fun way to tone your legs, skate fitness can help you achieve your goals. Skip the gym membership and skate at Wheels!